Viños de Encostas is the highly esteemed Xosé Lois Sebio's (of Coto de Gomariz) personal project of unique, small-lot wines coming from all around northwest Spain. Meaning, 'Wines of the Hills,' Viños de Encostas features only the top fruit of each region that Xosé has planted or works closely with, all in the hilly and steep zones within particular D.O.s or areas. A commitment to biodynamic and organic farming, leads him to make wines with the purest expression of fruit that the land has to offer. Used oak, natural fermentations, light filtration methods, and minimal sulfur usage are common practices at the winery in order to showcase the exceptional fruit that they work with. All wines in their line are remarkable examples of the best that northwestern Spain has, with its multitude of unique indigenous varieties. O Con is a serious expression of what Albariño from Galicia’s coast in Rias Baixas can be. The fruit was harvested from beautiful 40-year-old vineyards and brought in for a natural fermentation in stainless steel. The wine then rested for 11 months on the lees in order to add incredible depth and texture to the final wine. After it was bottled, the wine rested for almost 2 years before release, displaying the balance and robust character that Albariño is capable of. Very mineral driven on the nose, accompanied by flowers, citrus, and fruit. This direct and focused wine has great texture on the palate with remarkable acidity, and a very long and intense finish. Salvaxe is the result of very old vines of Lado and Silveriña, with a mix of younger vines of Treixadura, Albariño, Godlla, and Caiño Blanco. The old vines add such a layer of concentrated intensity, as well as minerality and fruitiness, that they make the finished bottle stand out as truly unique. After some time with skins during fermentation in stainless steel, the wine is moved to new and used 500L French oak Tonneaux for nine months, giving texture and style from start to finish. The final bottled result is loaded with lemon citrus, yellow plums, and white flowers, as well as distinct minerality. A unique white that is fitting for its name and label, the Salvaxe is a serious, strong, and impressive wine. Máis Alá comes from the A Rúa subzone of Valdeorras on a steep hillside outside the town of Barranco Rubio. The altitude makes for a fresher and more acidic finished grape that is destined to make great wine. Only 6,000 kg/hectare were harvested in 2015 because of the rain during flowering, and the fruit onset was fairly low. Once to the cellar, natural fermentation began in stainless steel and was moved to both used French barrique and used tonneaux for a ten-month aging period. The aromatics are highly intense with notes of flowers, spices, fresh fruit, and mineral. The palate is balanced and elegant, however very meaty and powerful as well, with rich fruit and a lot of character. Coios Mencía is a wine that comes from high slopes in the Valtuille Valley of the Bierzo D.O., giving an extraordinary freshness and depth to its fruit. The vineyard is full of Coios, which are boulders, having caused great struggle to the vines for growth, but in return the fruit has amazing finesse, minerality, and complexity. The wine ferments slowly at low temperatures in stainless steel in order to respect the fruit and its personality, before filled into French oak barrels of 300 liters. After 14 months in barrel, the resulting wine is elegant and fresh, but has a phenomenal structure. The nose offers lilacs, violets, spice, and fresh red fruit, and leads to a long and intense palate of fleshy fruit and earth. 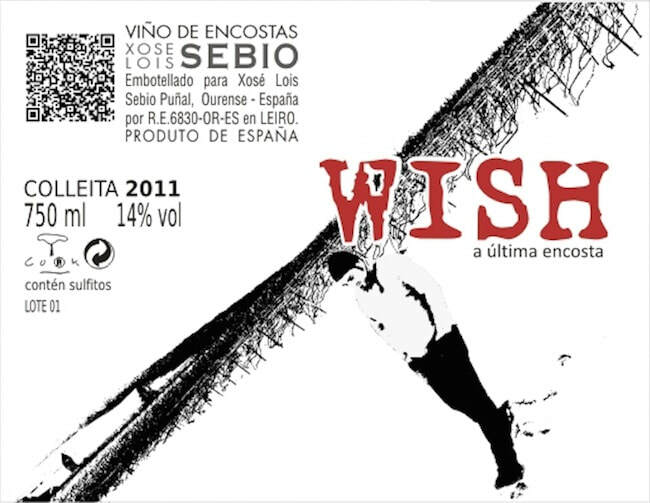 Wish is a blend of many indigenous varietals of the Ribeiro D.O., coming together from an old sloped vineyard to make a deep and complex red wine. When the grapes come into the cellar, they are naturally fermented in 2000L open stainless steel vats after a cold (pre-fermentation) maceration for one week. Manual punch downs and a mild pressing through an old screw press are two methods used to keep the sweetest and ripest tannins available in the fruit. Before malolactic fermentation can finish, the wine is moved into 300L, used French oak barrels where it then rests for 18 months. The resulting wine is violet in color, and shows gorgeous aromatics of lilac, red and blue fruits, and distinct minerality. On the palate, the Wish is fresh and fruity, with soft tannins and lovely acidity, a clean mineral driven tone, and a long intense finish. Heaven & Hell is a blend of the native Galician white varieties Treixadura, Albariño, and Godello. The old vines which are located all around Galicia, are harvested on a flower day according to the biodynamic farming calendar, and brought to the cellar for a natural fermentation in used French oak barrels of varying sizes, and then the juice continues aging for 10 months before it is bottled and rests until release. The resulting wine is beautifully textured on the palate, with loads of ripe tree fruits, tropical tones, as well as a mineral driven core behind it all. Very long in the mouth that has ample acidity to compliment the dense fruit. Super Héroe is a blend of native varietals grown on old vineyards, and on very steep slopes with low productivity. When the grapes come into the cellar, they are naturally fermented in 2000L open stainless steel vats after a cold (pre-fermentation) maceration for one week. Then manual punch downs and a mild pressing through an old screw press before malolactic fermentation can finish, the wine is moved into 500L, used French oak barrels where it then rests for 14 months. The finished bottling is remarkably balanced and exciting on the palate, with fresh and vibrant acidity, layers of dark fruit driven tannins, spicy notes, and hints of smoke.